What an ugly building you might say. But the logo at the building, the hand with an axe is a famous logo for one of the most used medicated oil around South East Asia. 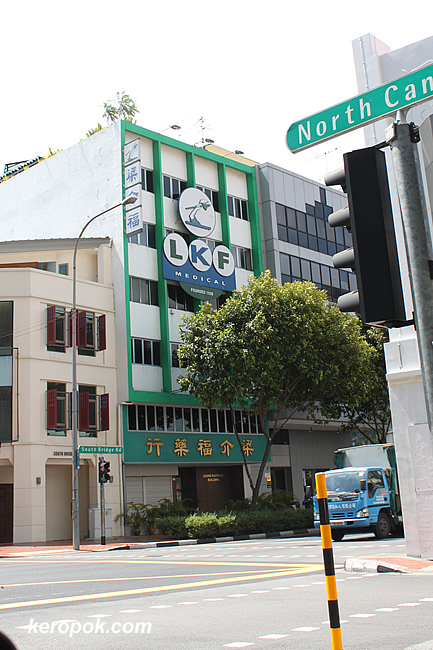 LKF Medical produces the famous 'Axe Brand Medicated Oil'. The locals (in the local Hokkien dialect) call it "hong you". The Malays who use it call it "minyak cap kapak". I can't stand the smell though. But there seems to be many people who are addicted to it. They will be dabbing bits of it at their upper lips near the nose or at the temple at their forehead. I was in the train the other day and the person beside me had it on. Do you use the medicated oil? I suddenly remember a secondary school classmates who is addicted to the smell. He will dab some of the oil to his handkerchief and sniff his hanky all day long! This is a famous brand. Many old folks can't live without. Some apply all over the body like magic potion. If applied in a confined place like the cinema, taxi or inside aeroplane, it is sofocating and makes a healthy me sick. I shutter to think of this. Oh no, I hated the smell especially on long bus trip, I would feel even more car sick...lol. One man's meat is another man's poison. But there seems to be less people who carry this around nowadays right?